Aviation Safety Network records indicate that over 80 passenger, cargo, and military transport aircraft went missing without a trace since 1948. 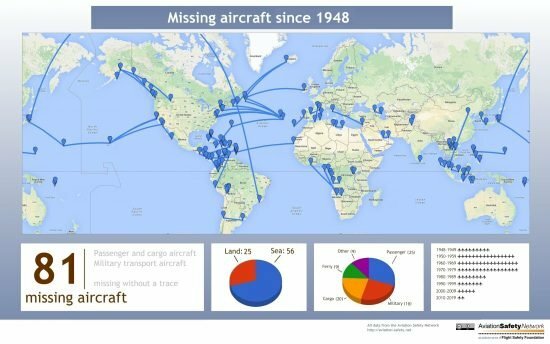 From the extensive ASN accident database, a list was compiled detailing 85 cases in which a passenger, cargo or military transport airplane went missing without a trace. In these cases not a single piece of wreckage, oil slick or body has been found. Additionally, five corporate jets, eight maritime patrol aircraft, and six air taxi aircraft are listed. Other numbers have been circulating in the media, also based on ASN data. These numbers are based on the same data but may have used different selection criteria like including or excluding corporate jets or certain military flights. The numbers presented here may change as it is difficult to determine in what cases actual debris has been located, sometimes even after many years. For instance, a BSAA Avro Lancastrian that went missing between Montevideo, Uruguay and Santiago, Chile in 1947 was located in January 2000. Also, the wreckage of an Indian Air Force An-12 transport plane was located in August 2013, forty-five years after it went missing with 102 on board.